One of the magazines in that stack was Better Homes and Gardens. We weren't subscribers, but, every now and then, my mother would bring an issue home. I was instantly a fan. Fast forward about twenty years to an age where everything is digital. Now, it's vitally important for print publications to maintain an online presence for the purpose of sharing information with their audiences and for staying current. Although I love everything about BHG, I concentrated on the sections of the website that focused on Recipes and Cooking. I love that there are multiple ways to search for recipes. You can do a "Quick Find" at the top of the page by meal or type of recipe. Or, you can filter recipes with a click of your mouse on the sidebar at the left of the page, especially useful if you're looking for a recipe that features a specific ingredient or adheres to specific dietary restrictions or highlights a specific ethnic cuisine. Multiple ways to get to the same information = great in my book! But I really fell in love with the new slideshow formats. I went through the recipe slideshows and couldn't help drooling over the stunning photos. (I really need to improve my food-styling skills.) Navigating through the slideshows is easy, but what's truly ingenious is the ability to view all thumbnails. If you're like me, you've gone through slideshows and then want to return to a specific photo by the time you've reached the last one. (I can't be the only one.) Rather than clicking back through the photos until you find the one you're looking for, you can just click on view all thumbnails at the top of the screen and scan for the one you want! Much, much more efficient! 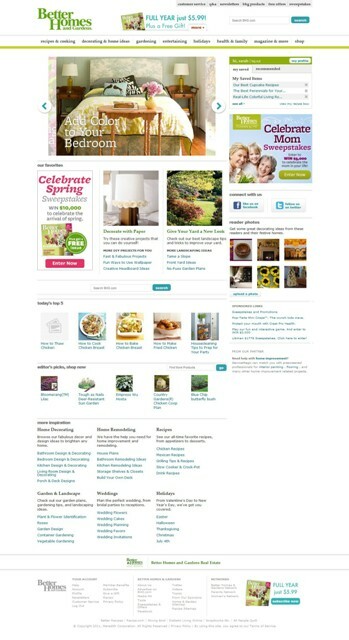 Overall, I'm really pleased with the changes that have been made with BHG.com. I think they consider their audience and made interacting with the website much more enjoyable. Bravo! To celebrate the launch of the redesigned website, BHG has given me five 1-year subscriptions to the Better Homes and Gardens magazine to give away to the readers of Taste As You Go! Go to the Recipes and Cooking channel on the new website and choose a recipe you'd like to try. Come back to this post and leave a comment telling me which recipe you picked. Follow @tasteasyougo on Twitter and tweet the following: "I just entered to win a subscription to @BHG from @tasteasyougo! http://bit.ly/iDI5IA". Then come back to this post and leave an additional comment with your Twitter name. Become a fan of Taste As You Go's Facebook Page and post the link to this giveaway on your profile. Don't forget to tag Taste As You Go! (If you don't know how to do that, click here.) Then come back to this post and leave an additional comment. This giveaway is open to US readers only and will end on Tuesday, May 31, 2011 at 11:59pm EST. The five winners will be chosen with the help of Random.org and will be announced on Wednesday, June 1, 2011. Taste As You Go Disclaimer: Prizes provided by BHG.com. I did not accept monetary compensation for writing about the BHG.com website redesign or about my experiences while navigating the site. All opinions expressed are my own.